Avocado lovers, I hereby present your dream come true! 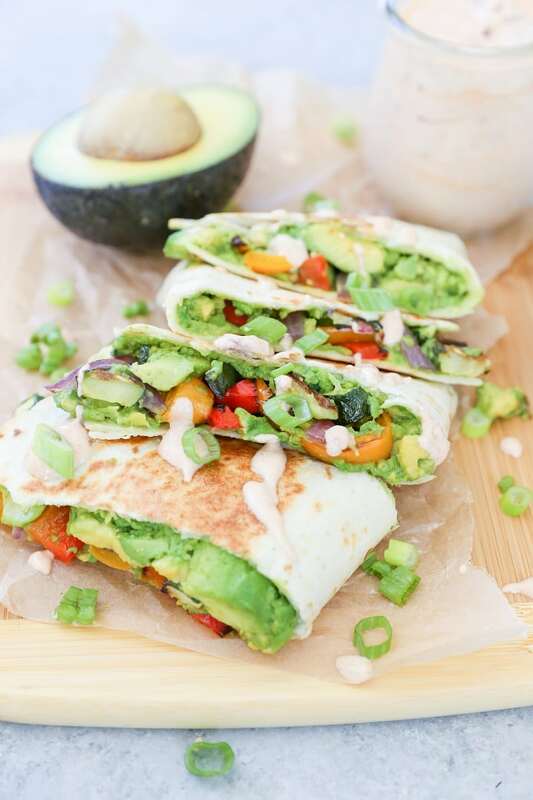 Avocado quesadillas are my newest food crush…have you partaken? 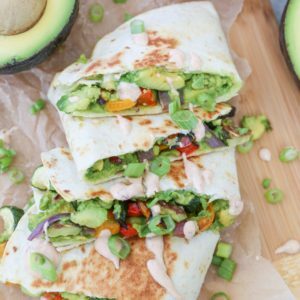 The avocado quesadilla concept is just as it sounds: Mash up a whole avocado, sprinkle it with salt, and fashion up the most glorious cheeseless avocado quesadilla using grilled or roasted vegetables and anything else you could possibly want to swaddle in a tortilla. Using mashed avocado in place of cheese is a winning dairy-free, healthier option for the crispy ooze fest. We’ve already had the warm avocado conversation, but in case you didn’t catch my 30-Minute Thai Green Curry with Avocado post, and you’re feeling anxious about the warm avocado situation, I can assure you, warm avocado isn’t anything to worry about. In fact, I welcome it in all sorts of forms, including quesadillas. 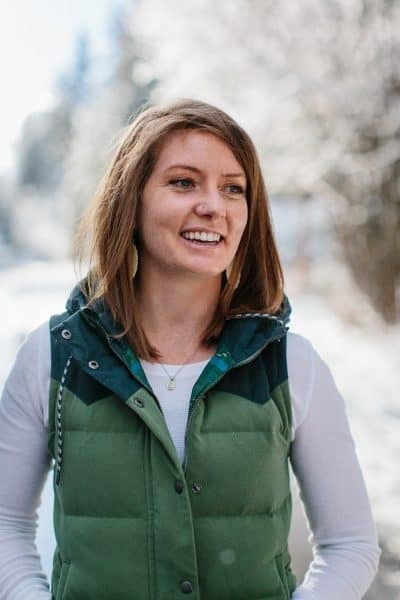 You’ll just have to hike up your britches and put your trust cap on! …And what better time to go experimental with avocado than during California Avocado month? The month of June is California Avocado Month, and although I never need to be prompted to eat gobs of avocado, it does inspire me to go avocado heavy more so than usual. 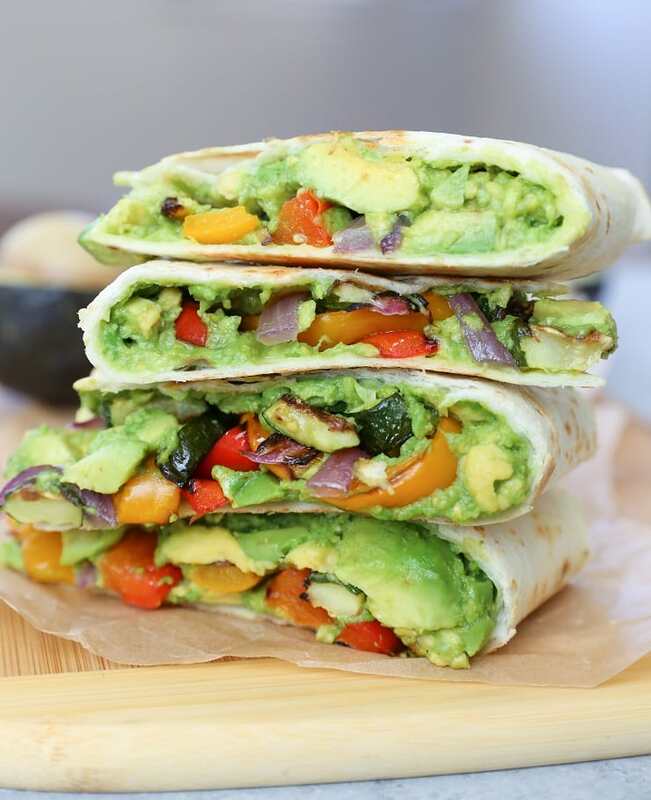 I’m thinking avocado quesadillas with all sorts of grilled veggies is the perfect signature meal for the month. If you’re looking for some animal protein, simply grill up some chicken, beef, or shrimp! 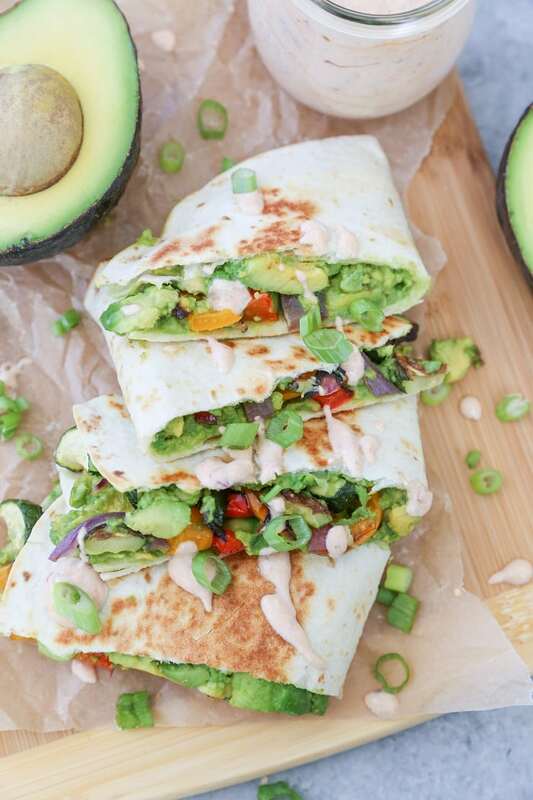 The way this all shakes out, you end up using an entire avocado per quesadilla, giving you plenty of creamy glue to hold your grilled vegetables inside your quesadilla. Whipping up a spicy chipotle cashew cream for topping the quesadillas gives them that extra flair to balance the whole thing out. Add fresh lime juice and one finely minced clove of garlic to the mashed avocado to turn this into a guacamole quesadilla situation. Toss in some grilled chicken, tri tip, shrimp, bacon, etc, for some animal infusion. Get creative with your stuffers…you can go Greek or Mediterranean-themed, using sun-dried tomatoes, spinach, feta (if you’re not vegan), kalamata olives, cucumber, heirloom tomato, etc. If you aren’t vegan and you’d like to save yourself some time, you can use ½ to 1 cup of whole milk yogurt instead of soaking and blending up cashews for the chipotle sauce. If you’d like an avocado dessert to finish out your avocado feast, be sure to try my Vegan Key Lime Ice Cream, Healthy 4-Ingredient Chocolate Mousse, or Vegan Beet Chocolate Pudding. Have a happy Monday, and a glorious month of avocado-infused eats! Add the ingredients for the chipotle cashew cream sauce to a blender or food processor and process until completely smooth - you may need to stop the blender and scrape the sides a few times. Transfer to a jar and refrigerate until ready to use. Note: the sauce will thicken in the refrigerator. Mash the avocados in a bowl and sprinkle with sea salt to taste. Preheat the grill to medium high. Brush all of the vegetables with olive oil and sprinkle with sea salt. Place the vegetables on the hot grill and cover. Cook for 5 to 8 minutes, flip and continue grilling another 5 to 8 minutes, or until charred and soft. Transfer vegetables to a cutting board and chop into bite sizes. Heat a large skillet to medium-high and add enough oil to lightly coat the surface. Place one large flour tortilla on the hot skillet and spread half of the mashed avocado mixture over the whole tortilla. Cook for about 30 seconds to 1 minute. Layer a generous amount of vegetables over half of the tortilla, then fold tortilla in half. continue cooking until tortilla reaches desired level of crisp. Transfer to a cutting board and chop into pieces. Repeat for remaining ingredients. Serve quesadillas with chipotle cashew cream sauce and chopped green onion. I’m loving all of the healthy veggies up in the dillas. Plus that chipotle cashew cream? Oh girl. Now you’re speaking my language. YUM! And now I know what I’m having for dinner tonight :). 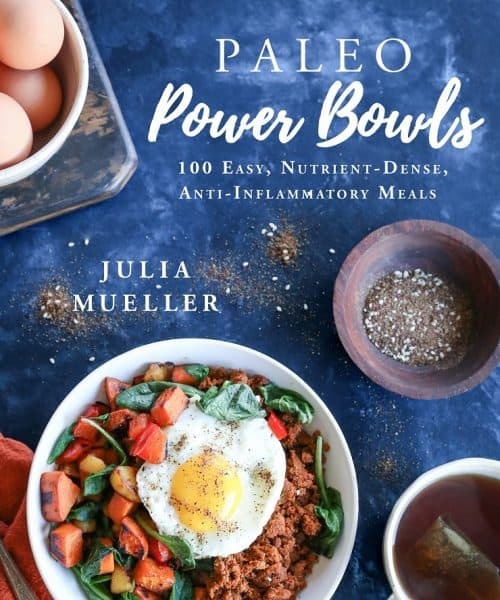 These look seriously awesome Julia! I’m pretty sure avocado month is the best month of all! I haven’t even heard of avocado quesadillas, but now I’m craving one! I love salad with avo and roasted veggies, so I know avo and grilled veggies will be even better up in here! These look absolutely SCRUMPTIOUS! You can’t go wrong with veggies and avocado! Remy’s favorite food is avocado!! Seriously, when I can get her to eat NOTHING (which happens for at least one meal a day), she will at least eat avocado. Totally have to try these! Simply outstanding recipe. I will try this one.